During the holiday season, as the weather gets colder and the days get shorter, Christmas lights begin to sparkle along the streets. Capturing the imagination of children and adults alike, it is a time-honored tradition to hang white and colored lights across roofs and trees. Some places like to take this idea and run with it, making over-the-top decorations and stringing along lights that go on for miles at a time. These well known light shows will awe and entertain you the minute the sun goes down. Drive through Hersheypark's two miles of wooded trails and see over 600 displays shine through your car window. Part of Hersheypark Christmas Candylane, Hershey Sweet Lights is a self described "holiday drive-thru spectacular," and includes holiday favorites such as Santa and his reindeer. Set your car radio to the right frequency and the sound of Christmas carols will accompany you and your family throughout the path. Where to Stay: The Victorian Rose Bed and Breakfast(www.bnbfinder.com/victorianrose), located in Mount Joy, PA, is a quaint B&B right outside of Hershey. The historic home can house you and your family in one of its four elegant rooms featuring period décor, a perfect complement to the soothing experience of Hershey Sweet Lights. A natural beauty hidden in Denver, CO, the Blossoms of Light in the Denver Botanic Gardens is a sight to behold. Centered around the unrefined beauty of the DBG, nothing is off limit to the millions of lights that encase the garden. From the plants, to the fountains, to the very ground you walk on, everything is illuminated with spectacular colors. Warm drinks and seasonal entertainment are available some nights to round out the entire event. Where to Stay: Featuring a media room, jacuzzi tubs and tranquil views, The Eldora Lodge at Wonderu (www.bnbfinder.com/Eldora) is an ideal spot to take the entire family. With pool tables, darts and ping-pong, the kids will be entertained for hours while they wait for the Blossoms of Light at night. Skiing and snowboarding deals are included in affordable packages to make a truly memorable holiday getaway. Niagara Falls is a beautiful place no matter what time of year. 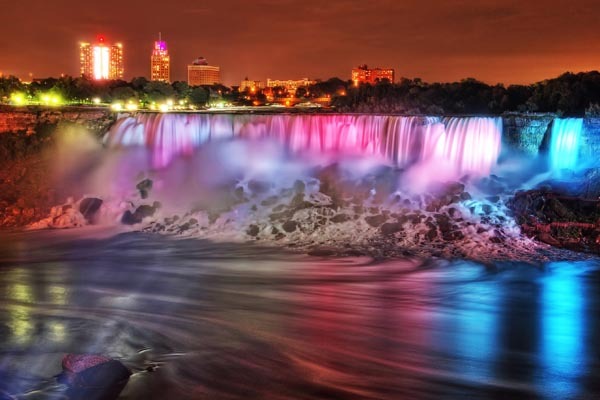 However, a short trip across the border during Christmas time and you'll be able to see the waterfalls in a whole different light. The winter Festival drapes the Falls in color and supplements them with over three-miles worth of trails overlooking both sides of the waterfalls. The trails include 125 animated lighting displays and 3 million decorated trees that you can walk or drive through. It's not known as Canada's largest illumination festival for nothing. Where to Stay: With its custom-built pre-Victorian style, John's Gate Gourmet Bed and Breakfast (www.bnbfinder.com/johnsgate) is a one of a kind experience, much like Niagara Falls themselves. Complete your stay with one of the nearby cooking schools, the fine and family style restaurants, or one of the world famous spas. For over 50 years, the Trail of Lights in Austin, TX, has become a staple of Christmas in the south. Ringing in the holiday season, the show features holiday character favorites as well as Texas icons. Several modes of transportation, whether it is by shuttle, car, bus or rail, means you won't have to fuss or worry over bringing the family to the $1.5 million light extravaganza. Food vendors offer a smorgasbord of local Austin favorites sure to fill any southern food craving you may have. Family-friendly activities such as crafts and a visit from Santa will keep kids amused for hours. Where to Stay: The Arbor House Suites Bed & Breakfast(www.bnbfinder.com/arborhouse) is a unique set of cottage homes found in the heart of San Antonio. Each guest suite is individually decorated in its own diverse way with a myriad of furnishings and art work. Distinctive and unique, much like the Trail of Lights, the recently renovated houses were awarded the San Antonio conservation Society Plaque, which is given out for excellence in historic renovations.